Please disregard the horrible cocktail in the making on the picture. Well, I have kinda predicted and asked for it long time ago, still on my old blog. Using liquid measures is kind off... outdated. Then I was calling for digital scales to measure your ingredient. Guess what, Brookstone introduced one system, which goes far beyond a simple digital scale. Basically the system consists of a Bluetooth enabled digital scale, which hooks up with your Android or iOS device. Also part of it is an app which offers drink recipes, and measures live the ingredients you're adding. Truth has to be told- it was not yet tested. How good and accurate are the available recipes? Is there an options to define your own recipes (and is this easy to do)? Are the conversion from volume measures to weight accurate (problem here is, that booze, and especially liqueurs have a different weight than water)? These questions and many more still has to be answered. Yes, this device is also rather for the amateur market, but lets hope, that this sparks the idea of a professional system. For the commercial system, I would skip the usual scale plate. This is not practical and visual appealing in a bar environment. Hence I would replace it with scales with a much smaller footprint and a "glass tube" in which you measure the ingredients (as additional bonus, you could have volume measures on the tube, in case the system doesn't work, you still have got the usual routine behind the bar). And you supposed to hook up several scales, to be able to make more than one kind of cocktail at a time. Off course the app would need to be also adjusted, showing no tricks (distracting) but just the plain, easy to read recipe/proportions and have to have also a function to multiply a recipe- with the right convertion of amended dilution (e.g. Might mention to include still water to a cocktail, when two of the same drinks are mixed in one shaker). And, it should weigh the ingredients in g and ml! To make the system even more perfect, it should be able to hook it up to the POS system, show you, which cocktail should be prepared first and have its own logarithm to calculate and display the best efficiency while preparation. Well, it also could not harm, to have a time status bar for preparing the drink - so the most common mistake (shaking/stirring a drink not long enough) is also covered. I think such a system could rock. A lot of people are definitely against it, bringing up individuality and the bartender's freedom. But, excuse my straight words here, this is crap. Most of the times, a bar is suffering from inconsistencies. If you take the automotive industry as example; they totally excluded the "workers individuality" - even in hand-made cars, resulting a much higher average quality. There is too much bullshitting in the bar and a lack of accuracy and a system like this would definitely help. 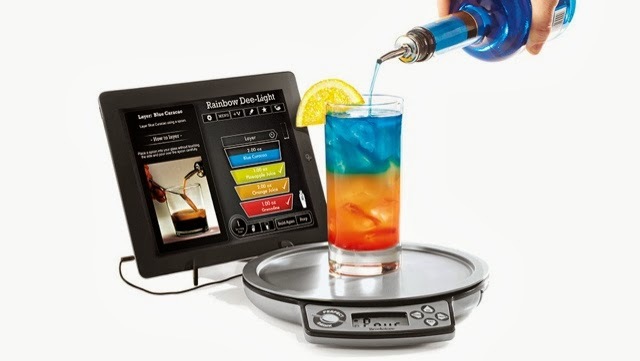 What do you think, would a system, like the Brookstone's system help- or will it threaten the craft bartender?